Summer is almost gone, so it's time to plan a fun getaway to send it off in style. What could be more fun than taking an air tour of the Grand Canyon? If that sounds like a good plan, then here are some tips for having a great time and getting a good deal. Even though summer is about gone, the temperatures are still hot at the canyon. Temperatures can soar about midday, so if you want to stay cool, pick a tour that leaves early in the morning or later in the afternoon. Sunrise and sunset tours are idea because it's cooler then, and also, the scenery is a lot more colorful. The helicopters used on these tours offer climate control, so you'll be comfortable while you're in the air, but if you take a landing tour, be prepared for the intense heat when you get out of the chopper. You'll want to wear lightweight clothes and sun protection in the form of sunglasses, a hat, and sunscreen. Some Grand Canyon flights that depart from Vegas fly on the EcoStar 130 choppers. You'll get optimum views from one of the helicopters, and your ride will be comfortable too. The comfy seats are arranged stadium style, and that means there are no bad views, so you'll be able to see everything without obstructions in your line of vision, and you'll have plenty of personal space for added comfort. You'll be glad you booked a tour on one of these helicopters when you see the massive windscreen that wraps around the front of the chopper giving you panoramic views. As an added bonus, you'll get complimentary limousine service to and from your Vegas hotel when you book a deluxe flight in an EcoStar 130. In addition, the deluxe tours depart conveniently from the Vegas Strip, and the basic tours depart from Boulder City, which is a shuttle ride away. Helicopters on the Grand Canyon flights that take off from Las Vegas go only to the West Rim, and this is the only portion of the canyon where choppers can descend into the canyon and land on the floor. You can book a landing tour that lets you out on top of the rim or on the canyon floor Both options are fun, and if you have enough time, you can explore both areas of the West Rim. If you want to take a helicopter tour of the South Rim, you'll need to depart from the airport in Tusayan, Arizona instead of Las Vegas. These tours are a totally different experience since they fly along the North and South Rims. You can choose from two tours. One option is a flight that goes to the North Rim and back, and this one lasts about 30 minutes. The other tour option follows the same flight path as the 30-minute tour initially, but it also adds on a jaunt over to the eastern edge of the national park. 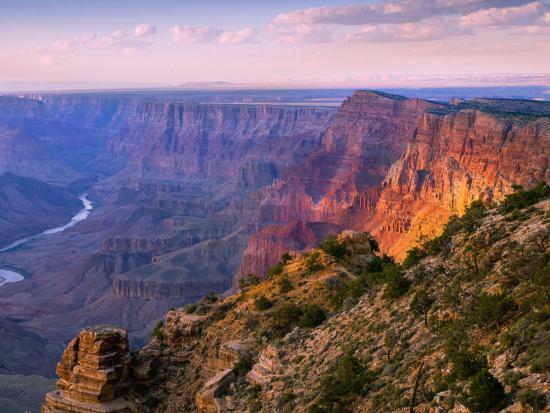 This longer tour is very comprehensive since it takes you over about 75 percent of the Grand Canyon National Park on its flight that lasts nearly an hour. Although your helicopter won't land in the canyon, you can still explore the canyon from the ground by booking a Jeep tour out of Tusayan. The Jeep tour is a fun way to add some adventure to your trip and see the canyon up close and personal. Booking a tour package that includes an air tour with a Jeep tour is the ideal way to experience the beauty of the South Rim and all it's wilderness area and famous landmarks.